One of the things that I learned back in the day when I was pursuing a higher education in the art/science/magic of chemistry was that it really wasn’t in anybody’s interest that I actually become a chemist. Sure, I could, at the time, recite from memory that the bond length in an oxygen molecule was 121 picometres, or the impact of left and right enantiomers on organic chemistry workups involving Grignard reagents (thanks, Google), but when it came to actually making stuff or even actually measuring stuff (you know, actual chemistry stuff), the results were, ahem, inconsistent. Another thing that I learned, perhaps more importantly, was that chemistry was really just a matter of context and circumstance…not just that my pursuit of things chemical was out of context (it was), but rather that how an atom reacted in a certain time and place could/would be completely different from how that exact same atom reacted in a different time and place (though now that the existence of gravitational waves has been proven, perhaps it’s possible that an atom could be in two different places at the same time?). Take for example, our good ol’ atomic friends hydrogen and oxygen. 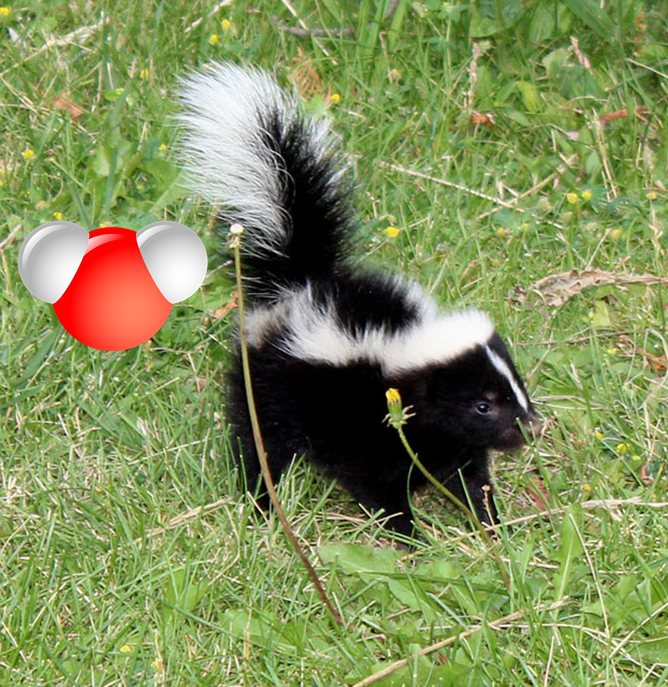 Under the right set of circumstances, hydrogen atoms and oxygen atoms will combine to form dihydrogen monoxide (DHMO). And while under some circumstances DMHO is rife with potential risks (everything from bad hair days to treacherously slippery sidewalks to serious bodily harm), in different settings it has proven invaluable for…well pretty much everything living. Now take a different set of circumstances, where you have the same ol’ hydrogen atoms and same ol’ oxygen atoms but this time they combine to form hydrogen peroxide, a compound that’s found use in turning dark hair light, removing odours from dogs that have found themselves on the receiving end of a mixture of (E)-2-butene-1-thiol and 3-methyl-1-butanethiol sprayed from the scent gland of an animal from the family Mephitidae (there’s me showing off with my Google again), and, among other things, as a sterilant not uncommonly found in hospitals. Now, the purpose of these examples was not to show how completely and utterly I rely on Google to know things these days, but rather to illustrate the point that chemicals are at their best when they’re used for the right application in the right place at the right time…like in our labs, for cleaning and maintaining our buildings, and in the pharmaceuticals prescribed to our patients. if you work, play, visit, or hang-out anywhere at UHN and find an unlabelled bottle of funny coloured liquid in the back of a cupboard…ask! Because the disposal of chemicals and drugs is something we all want to make sure is done under the right set of circumstances.